This is a wholesome, refreshing and pretty-looking breakfast or snack. Ingredients (for a big plate serving 1-2): Your favorite granola, ½ cup. Plain yogurt. ½ cup. Fresh apple, pears, pitches and melon, thinly sliced, ½ cup each. Some fresh blueberries, raspberries and one ripe, medium size strawberry, cut like a “fan” (This video shows you how, if you do not know already) . Hot chocolate, or honey or maple syrup., 1 tbsp. Cinnamon, 1 teaspoon. To arrange in a dish: Place the fruits’ slices around the plate, leaving some room on the edge. 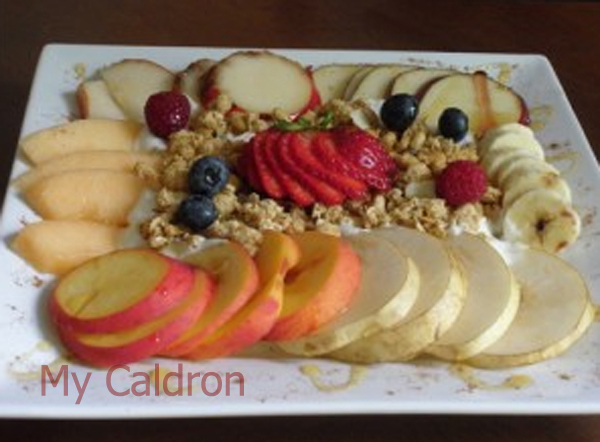 Place yogurt in the middle and let it run over the edges of your fruits’ slices. Top yogurt with granola. Place the strawberry in the center, and throw in a few berries around it. Using chocolate or honey, pipe a continuous line that curves over entire dish. Sprinkle cinnamon on the plate’s edges.